Our aim is to produce Quality Welsh Wines. We are very passionate about what we do here at White Castle Vineyard and are always striving to be as good as we possibly can be. We feel very privileged to have a vineyard here in Abergavenny. 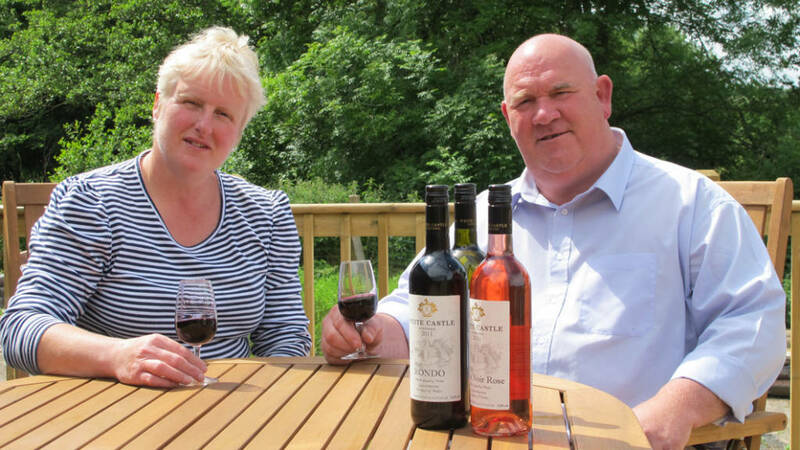 White Castle Vineyard is a small Welsh vineyard situated near the market towns of Abergavenny and Monmouth it is owned and run by Robb and Nicola Merchant. Having purchased the 12 acre small holding in 1995 they converted the milking parlour into their home a year later, however it was 2008 before the dream of owning a vineyard become a reality, the 5 acre gently sloping, south facing field was purchased, soil tests were performed and vines ordered. May 2009 saw the planting of 4000 vines, the varieties of vines planted were Pinot Noir, Regent, Rondo, Seyval Blanc & Phoenix, now there was no turning back, May 2010 saw a further planting of 800 vines this variety being Siegerrebe. Robb & Nicola have attended Plumpton College East Sussex to study viticulture, this training giving them the skills needed to produce quality Welsh Wines. The Scott Henry trellising system was erected in 2010 with the help of family members. The first harvest taking place through October 2011. We believe that quality wine making starts in the vineyard. We have carefully selected varieties that we know will grow well in our soil and produce grapes of the highest possible quality in the micro climate of the vineyard. The grapes are closely monitored, as they ripen they will be carefully hand harvested and selected, then immediately transported to the winery for pressing to ensure we retain all the freshness and fruity aromas intact. We visited with friends and were given the tour of the vineyard by the owner. He was friendly, informative and his passion for his craft was obvious. We were shown around the restored barn and then the vines where I personally learnt a lot about the wine making process, from vine to bottle. We then went on to taste some of the wares and again my education continued. We left with some of their sparkling white wine and fortified wine(untasted) and our friends took a variety of the red wines. The fortified wine(port by another name) was excellent but the sparkling wine was absolutely superb! As good as, if not better than, any champagne we’ve had in the past. This is a great way to spend an hour or two, having your knowledge expanded by an excellent host. We discovered White Castle Vineyard while driving to visit the nearby White Castle on a weekend excursion from the Cotswolds. The vineyard is not large. Think quality over quantity. I enjoyed the vineyard tour, wine tasting, and talking with Rob more than I did visiting the White Castle (which was pretty cool to visit). The wine was good. I definitely recommend a visit if you are in the area. Make it a stop on your Welsh wine visit. Rob also recommended the nearby 1861 restaurant. His taste in wine seems to be as good as his taste in restaurants. I just wanted to say yet again thank you so much for a wonderful tour. The delegates loved it and those that couldn’t make it were very envious from the feedback those that attended gave back that evening. Your enthusiasm for what you do and the area really added to the day, and especially the theme of promoting business in Abergavenny, which was fantastic. Thank you for taking the time out to host us and for your warm hospitality. As I say, I’ll be back soon no doubt for some more tasting / buying but if you do have any events you’d like me to include on the www.visitabergavenny.co.uk website, do let me know.